Are you looking for a dentist you can trust for your entire family? Soft Touch Dentistry is pleased to offer top quality family dentistry and cosmetic dentistry to patients in O'Fallon and the surrounding St. Louis communities. Our team includes an experienced, personable and talented dentist and a skilled dental support staff who are passionate about caring for your smile. Whether you need preventative or restorative dental services to maintain the health of your smile or our expertise in cosmetic dentistry to enhance the beauty of your smile, we can help you at Soft Touch Dentistry. We make your comfort our priority. We have a contemporary office environment that helps you feel at ease, including amenities such as warm blankets, relaxing music, large screen TVs as well as chair side patient education videos to keep you well informed of your dental procedures. 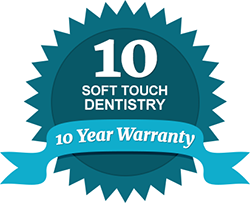 You can trust that Soft Touch Dentistry utilizes the latest dental technology and state-of-the-art equipment to ensure that you get the most effective treatment and long-lasting results you deserve. We also offer options in Sedation Dentistry to keep patients comfortable and relaxed during their procedures. Dr. Thompson is among the elite 5% of U.S. dentists to offer IV Sedation dentistry. For complete dental care that is personalized to meet your family’s individual needs, choose Soft Touch Dentistry. We offer full-service family dentistry, including routine cleanings, mercury-free fillings, custom mouth guards and more. Our practice is also known for creating beautiful, long-lasting smiles with our expertise in dental care. Whether you need Teeth Whitening, Lumineers or Invisalign, we are equipped to help you achieve the confident smile you desire through any stage of life. To learn more about our dental services or to schedule an appointment with Dr. Thompson, please contact our office today. We look forward to caring for your oral heath needs in every way possible.